This year, 2011, is our ninth year as Innkeepers at our Cape Cod Bed and Breakfast in Sandwich, Massachusetts. We have enjoyed wonderful guests from all over the United States and many other parts of the world. We have learned that many people who are visiting Cape Cod for the first time are surprised at its size and the fact that it is and island that is separated from mainland Massachusetts by the Cape Cod Canal. To get onto the Cape, you will cross one of two bridges that span the Canal; the Sagamore Bridge to the east and the Bourne Bridge to the west. Cape Cod is approximately 70 miles from Bourne to Provincetown. At its widest it is about 25 miles, and at its narrowest about 1 mile wide. It is 413 square miles of some of the world’s most beautiful forests, dunes, marshland, and beaches. Cape Cod is made up of many villages and towns, some bordered by Cape Cod Bay to the north, others by Nantucket Sound and the Atlantic Ocean to the south and east. Each village and town has its own unique flavor and charm. 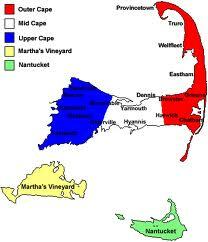 The islands of Martha’s Vineyard and Nantucket are off the coast of Cape Cod. The Cape is geographically distinguished by three areas: Upper Cape, Mid Cape, and Lower Cape (shown as Outer Cape on this map), each with its own separate Villages and unique attractions. The Upper Cape is made up of the towns of Bourne, Sandwich, Falmouth, and Mashpee and is the part of the Cape closest to the Mainland. The Mid Cape includes the towns of Barnstable (which has 7 villages), Yarmouth, and Dennis. The Lower Cape includes the towns of Harwich, Brewster, Chatham, Orleans, Eastham, Wellfleet, Truro, and Provincetown. We will be blogging about the special points of interest of each of these areas. We hope that you will continue to read our blogs and that this information will be helpful in planning your visit to Cape Cod. While we often have guests for extended stays, most folks visit the Cape for three or four days. We do our very best to help our guests make the most of their time here so that they take with them wonderful memories of time spent on Cape Cod. One of our best suggestions to those planning a trip here is to purchase a copy of An Explorer’s Guide – Cape Cod, Martha’s Vineyard & Nantucket written by Kim Grant. It is one of the best guidebooks about our area that we have seen and it can be found in book stores and online from Amazon. We are offering a number of special packages to enhance your visit to Cape Cod. We hope to be welcoming you to our Sandwich Bed and Breakfast very soon. There are many wonderful adventures to be had near our Sandwich Bed and Breakfast. The historic charm of Sandwich Village is in evidence around every corner, and nowhere more so than at one of the country’s oldest Mini Golf Courses. The perfect outing on a warm summer night that doesn’t involve sand in every conceivable crevice, mini golf is one of those quintessential Cape Cod traditions. There is nothing quite like a good, old-fashioned game of mini golf followed by an ice cream treat. Sandwich Mini Golf was the boyhood dream of Maurice Burke who built it in the mid 1900’s, and still maintains this charming little course. It is located on property that was owned by Mr. Burke’s grandparents in the late 1800’s. Maurice dreamed of making the marshland into a quaint, Cape Cod mini golf course. It became his lifelong hobby with many bridges and regionally-themed holes, some of which are named after his grandchildren. 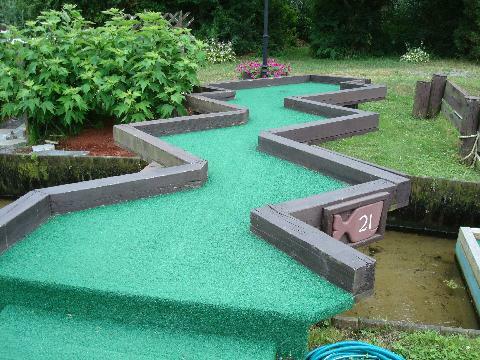 Located right on Route 6A in Sandwich, Sandwich Mini Golf is themed around the Cranberry River. This gently flowing stream has a ship named the Molly Rebekah, a River Raft, and a Cranberry Covered Bridge. The first bridge you putt across will take you to Treasure Island. The second dips down and up onto the Lily Pad. After putting over the water on Sand & Surf, you take the curved sloping bridge to the green. A fourth bridge crosses from Sandwich Lighthouse up a plank to the Olde Docke. Cranberry Covered Bridge is number 5. Sandwich Mini Golf is open during the spring and summer months from 10:00 am until 9:00 pm except on Sunday, when the hours are from noon until 9:00 pm. Kids two years old and under play for free and must be accompanied by an adult. Those from three to twelve can play 18 holes for $6 and 35 holes for $10. Adults play 18 holes for $7 and 35 holes for $11. You will find many places to play mini golf on Cape Cod, but none as quaint and charming as Sandwich Mini Golf. Come stay at our Cape Cod Bed and Breakfast and top off a day of exploring the Cape with a little mini golf and then head on over to Ice Cream Sandwich or Twin Acres Ice Cream for an unbelievable ice cream treat. When you make your reservations to stay at the 1750 Inn at Sandwich Center, mention that you read this blog and two tickets for Sandwich Mini Golf are on us.